Ivan Osim – often popularly known as ‘Ivica Osim’ – was born in Sarajevo in 1941. The son of a Slovene-German father and Polish-Czech mother, he grew up during times of ethnic strife. Germany had invaded the then Yugoslavia just a month before his birth. It was a traumatic time that would burn deep into the mindset any young child, and it would be hugely understandable if the experience endured by the young Ivica would influence his attitude to issues in his later life. At the end of the conflagration, Osim turned to football, playing for the youth team of local club FK Željezničar Sarajevo in 1954. It quickly became clear that here was an outstanding talent, and the club progressed him through their ranks. Just five years later, the eighteen-year-old Ivica made it into the first team. He would stay with his home town club for nine years, and developed into one of the best footballers to come out of Bosnia. A creative player with an instinctive ability to read the game and deliver the cutting pass, he also had a natural talent to dribble and beat a player on either side. He became a star of the team, and but for the ban on imposed by the Yugoslav FA preventing players from moving abroad until their 28th birthday, may well have been snapped up by a wealthy western European club much earlier than eventually was the case. Reaching the required age in 1968, he decamped to the Netherlands, joining Zwolsche Boys, but any high expectations for his time in the Low Countries were cut down to size by a knee injury and just three months later he moved to France, joining Strasbourg. He would remain in France until retiring in 1968, during which time he had also served time playing at Sedan and Valenciennes, before returning to the Alsace club for the last couple of years before hanging up his boots. By this time, Osim had also graduated to the Yugoslav national team, representing his country 16 times, including the 1968 European Championships where he played in the semi-final defeating England, but missed the final and replay when Yugoslavia lost 1-0 to Italy, following a 1-1 draw in the first match. After retirement, it seemed a logical step for Osim to move into coaching and returning to FK Željezničar offered an ideal opportunity. He would stay with the club for eight years, developing his patterns of play and learning how to coax the best performances out of a group of players. Although not one of the powerhouses of Yugoslav football, FK Željezničar had a strong reputation for bringing through talented young players, and this fitted well with Osim’s approach. It was match that benefited both parties. Whilst Osim honed his technique, the club also prospered, at one time finishing third in the Yugoslav league. He also took them to a Yugoslav Cup Final. The growing success allowed the club to indulge in European excursions and, in the 1984-85 season, they reached the semi-finals of the UEFA Cup before being eliminated by Videoton of Hungary. It was a disappointing defeat, made more poignant by the denouement of the game. After losing 3-1 in Hungary, FK Željezničar were 2-0 up in the home leg with the enticing prospect of a final against the might of Real Madrid in their grasp. With just two minutes remaining though, a late goal turned the tie. Osim and his players missed out on the opportunity for undreamt of glory. The success of the team, and particularly the growing reputation of the coach, had not gone unnoticed however, and in 1986, Osim was invited to take charge of the Yugoslav national team. It was a logical step as he had already been introduced to the international arena when invited to assist Ivan Toplak, coach of the Yugoslav Olympic football team, that won the bronze medal at the 1984 Games. Despite this successful ‘apprenticeship’ things didn’t begin well in his new role. The attempt to qualify for the 1988 European Championships was stymied by Bobby Robson’s England. Although Yugoslavia recorded home and away victories against both Turkey and Northern Ireland, the other two teams in the group, a 2-0 defeat at Wembley in November 1986 meant that only a substantial home victory twelve months later would hold out any prospect of Osim’s team having the chance to progress. In the end though, England triumphed in Belgrade 1-4, in a game where his team failed to compete, and it seemed that Osim’s time in the hot seat may well be coming an end. The man with the reins of power at the time though was Miljan Miljanić, president of the Yugoslav Football Association and, dispensing with the normal procedure of dismissing the coach in the wake of failure, used his personal prestige to ensure that Osim would be given another chance to prove his worth. It would prove to be a wise decision. Initially though it didn’t appear to the case. The opening game for qualification to the 1990 World Cup saw Yugoslavia play out a tame 1-1 draw in Scotland in September 1988, after being a goal down. A much more encouraging 3-2 home victory over France a couple of months later, followed up by a comfortable 4-0 win over the minnows of Cyprus put things back on track. The French were having a difficult time of it. A fact that would prove very beneficial to Osim’s team. After France had lost to Scotland 2-0, Les Bleus entertained Yugoslavia in Paris, and Osim’s team came away with a creditable goalless draw. Things would get even better over the summer and early autumn months of 1989. In June, Yugoslavia went to Norway and recorded a 1-2 victory, but when France paid a similar visit there in September they could only garner a single point with a 1-1 draw. The following day, Yugoslavia franked the form winning 3-1 at home to Scotland. It all meant that if Osim could lead his team to two victories in the last pair of matches, there would be little any of his rivals could do to prevent Yugoslavia topping the group. A 1-0 home victory over Norway, followed by a scrappy but ultimately efficient 1-2 win in Cyprus did the job. They may have been helped along the way by a misfiring French team, but Yugoslavia would go to the World Cup Finals in Italy as group winners. No-one knew it at the time, but it would be the last World Cup where Yugoslavia would compete as a single nation, but if this was to be their swan song, they would sing so sweetly – and hold the notes for quite a while – as Osim delivered their best performance for almost 30 years. Drawn in Group D, alongside West Germany and Colombia, plus the makeweights of the UAE, progress was anything but a straightforward task for the Yugoslavs. In the opening game, a 4-1 demolition at the hands of, eventual champions, West Germany suggested their stay would be short unless they could engineer a win in their next game against the South Americans. A goal 15 minutes from time by Cesena defender Davor Jozić eked out the necessary result. It meant that, going into the last round of games, the second qualifying place alongside West Germany would be decided by which of the Yugoslavs or Colombians could get the best result. As Osim’s team were facing the UAE and Columbia were pitted against West Germany, the odds appeared to favour Yugoslavia, and so it transpired. Whilst a late Freddy Rincón goal, equalising an almost just as late strike for the Germans by Pierre Littbarski earned Colombia a creditable 1-1 draw, the Yugoslavs efficiently disposed of the UAE 4-1 to progress. In the first knockout round, they would be faced by a Spain side comprising the likes of Emilio Butragueno, Julio Salinas and Michel, and coached by the legendary figure of Luis Suárez. Getting past this team would require a big step up in form. After the first game setback though, Osim now had his team organised and playing with a flair that offered up reasonable hope of success. Yugoslavia would give the illustrious Spanish team all the problems they could want. Dragan Stojković was a commanding figure in Osim’s team as long-time skipper of the national side and the country’s top club, Red Star Belgrade. Ultimately his contribution in this encounter would be decisive. Before the game reached that point though a long period of stalemate ensued when a goal from either team looked to be wildly elusive. Then, with just a dozen minutes remaining, Stojković stepped onto centre-stage. A diverted cross landed at the feet of the midfielder on the corner of the goal area. Coolness personified, he controlled, feigned and then slotted the ball home. It was a wonderful piece of finishing and put Ivica Osim’s team on the brink of the last eight on the 1990 World Cup. It’s a strange but familiar phenomenon. In such games, when teams have fought out a closely contested game, as this was, and then one breaks the deadlock, the other often offers a swift riposte. This was certainly the case here. A seemingly reasonable penalty appeal had already been denied when, five minutes after the opener, Spain equalised. A determined driving run in to the Yugoslavia box by Martin Vasquez saw the ball squirm across the goalmouth towards the far post where Julio Salinas was the first to react. The Barcelona striker ponced and poked the ball home from a couple of feet. Yugoslavia had been dragged back and now the prospect of extra-time seemed inevitable. At such times, the value of the coach takes on even greater prominence. Inspiring tired limbs and weary minds, especially after seeing victory dashed away, can be a difficult circle to square. Osim had the ability and wise words to do so, and just two minutes into extra-time, Yugoslavia were back in front. Substitute Dejan Savicevic had come on to replace Darko Pancev ten minutes into the second-half and would now create the opening for the second goal. A strong run towards the Spanish area was brought to an abrupt halt following a foul by Roberto some 20 yards from goal. Up stepped Stojković to caress the ball around the wall to the left of Anton Zubizarreta and into the net. It was a goal worthy of winning many a game, and despite efforts by the Spanish to rally again, that’s just what happened as Osim’s men, marshalled from the bench, hung on to take the victory. Their quarter-final opponents would be Diego Maradona’s Argentina; again, a step up in the class of opposition. The game took place in Florence’s Stadio Comunale, and as with the game against Spain, much of it was a tight closely fought encounter, without either team managing to gain the upper hand. Just thirty minutes in however, the odds would tilt strongly towards the South Americans. Refik Šabanadžović was a player well known to Osim, had they had been at FK Željezničar together earlier in their careers. Both had since seen their careers progress, with Osim in control of the national team, Šabanadžović was now at Red Star Belgrade. The defender had acquitted himself well in the game against the Spanish, convincing Osim to give him the unenviable task of marking Argentina’s star player. It was a task requiring not only great technique, but also a level of discipline and concentration. Just ahead of the midway point of the first period, that discipline faltered as Swiss referee Kurt Röthlisberger gave Šabanadžović a yellow card for delaying an Argentine free-kick as he apparently sought to organise the defensive wall. While the free-kick came to nothing, the consequence of the card would influence much of the remaining part of the game and require a tactical masterclass from Osim. Seven minutes later, a foul on Maradona completed the set, as a red card saw the defender on his way from the pitch. Osim was clearly less than delighted and the unfortunate Šabanadžović would never play for his country again. The expulsion forced Osim into a reorganisation of his forces, compelled to defend against the reigning world champions with a Diego Maradona now freed of his allotted marker. Astute reorganisation however saw his team compete bravely despite, being outnumbered and could, on another day, have won the game as they engineered a number of chances, particularly in the second period after Osim had delivered an inspiring team talk and laid out the ways that a win could be achieved. At the end of the regulation ninety minutes and the further thirty, comprising extra-time, it had been a thoroughly meritorious performance to hold on for a draw. A penalty shootout would be required to decide who would progress to the semi-finals. José Serrizuela would open the penalty competition for Argentina. He sent Tomislav Ivkovic the wrong way to put the South Americans ahead. Stojković had been the star performer against Spain, but the fates of football are fickle and, in this game, they turned their gaze from the player bound for France and Olympique de Marseille at the end of the tournament. As Sergio Goycochea threw himself low and to his left, Stojković struck the ball high and to his right. The effort cannoned off the woodwork though and bounced clear. Stojković buried his head in his shirt as the goalkeeper celebrated something he had very little to do with. Stepping up next Jorge Burrichaga stroked calmly home and Robert Prosinečki replied in kind. Next up for the South Americans was their banker card, skipper and leading light, Diego Maradona. It was a tame effort from the superstar though and falling to his right, Ivkovic comfortably saved. If Savićević could find the net with the next spot kick, things would be all square with just two kicks left for each team. He calmly delivered. It was now bordering on a simple question of whose nerve would break first. Pedro Troglio looked calm as he stepped up, but his shot struck the goalkeeper’s left upright and bounced away. Advantage to Osim’s Yugoslavia! Dragoljub Brnovic appeared hurried in his anxiety to get his kick away. When struck it was weak and for the first time, Goycochea got his hand to one of the penalties and smothered it easily. It was sudden-death. Gustavo Dezotti drilled low and hard and all the pressure fell on defender Faruk Hadžibegić. Miss and it was the end of the road. A dive to his left by Goycochea saw him swat the ball away, and Yugoslavia’s World Cup journey had run into the buffers. Although a disappointment at the time, to take the reigning world champions to penalties, playing with just ten men for a full hour and a half had been an encouraging performance by the team and superbly marshalled by Osim. There was little doubt that he would stay in post for the upcoming qualification tournament for the European Championships of 1992. It would be an ill-fated campaign. Although qualification was gained, Yugoslavia would not compete in Sweden, being replaced by the eventual champions, Denmark. By that time though, Ivica Osim had already left his post. Speaking with compassion and regret, he declared that with his family under bombardment by Serbian forces, “My country doesn’t deserve to play in the European Championship. On the scale of human suffering, I cannot reconcile events at home with my position as national manager.” It was a principled position but, given the events around his early childhood and the understandable concern for his family, an entirely understandable one. Since 1991, Osim had split his heading up with the national team with coaching duties at Partizan, and took to them a Yugoslav Cup triumph in 1992, ironically defeating his former club, FK Željezničar, before leaving the Belgrade club, and moving to Panathinaikos in Greece where he also won the domestic cup and finished second in the league in 1993. After two seasons in Athens, he left to join Sturm Graz in Austria. He would stay with the club for eight largely successful years lifting the national title in successive seasons, the Austrian Cup once and the Supercup twice. He also qualified them for the UEFA Champions League in the seasons between 1998 and 2000. It was a magnificent achievement for a cub with limited resources but, inevitably, the time came when there was little else he could reasonably hope to achieve and so the next challenge was picked up. A would to Japan must have been a massive change for a sixty-year-old who, up to that date had only plied his trade in Europe, and even then only a relatively small part of that continent, but an opportunity to take control of J League club JEF United Ichihara, later relabelled as JEF United Chiba, took Osim to the Land of the Rising Sun. Pretty soon the club was also on the rise. Broadly similar to the situation with Sturm Graz, JEF United were also a club of modest means, in need of a coach who could produce an output greater than their individual parts would have suggested. In Osim, they appeared to have landed the right man for the job. Osim took the club from mediocrity into genuinely challenging positions, ending up as runners-up in the second stage of the league title race in 2003. It was the closest the club had ever come to league success. Two years later, JEF United won its first major trophy when they lifted the J League Cup. Ivica Osim had worked his oracle again, and quickly become a cult figure, and widely admired in Japan. Such was the case that a book of his collected quotes was published – “Words of Osim” – in 2005 and sold in excess of 400,000 copies, hitting the bestseller charts for a number of weeks. The unprecedented success with JEF United led to an invitation to take control of the Japanese national side in 2006, and although the team won their first game under his tutelage, defeating Trinidad & Tobago 2-0, tragically, it would only be a fleeting acquaintance. After a disappointing AFC Asia Cup in 2007, when Japan failed to win the tournament for the third successive time, Osim suffered a stroke at his home in Chiba, Japan, whilst watching a Friendly international on television between England and Austria. Falling into a coma, he was unconscious for three weeks before recovering on 3 December. His first words to his wife were apparently to ask the final score of the game he had been watching when he collapsed. A few days later, the Japanese FA announced that he would not be returning to his post. Ivica Osim would not coach another football club, but still had a role to play in the future of the game in his home country. 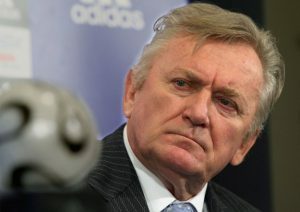 Many would attribute the revocation of FIFA and UEFA bans on the Bosnia Herzegovina Football Federation not only to the efforts of Osim, but also the weight that his heritage and integrity brought to the matter as President of the Committee for the Normalisation of the Football Federation Statute of Bosnia-Herzegovina. Ivica Osim had returned to Sarajevo and brought football back to his homeland. It is perhaps a fitting tribute to a man who not only excelled at being a footballer and a coach of the game, but also one, who dispensed more than a few wise words.